LED Lights—Are They Really Worth It? | Anderson Electric Corp. LED Lights—Are They Really Worth It? Homeowners are always looking for ways they can save on their utility bills. Upgrading to LED lights is frequently recommended as one of the best ways to do this. LED (light-emitting diode) lights do cost more to have installed than standard incandescent lights, however. This causes some people to balk at making the upgrade. Are LED lights actually worth the initial cost of the upgrade? The simple answer is “Yes!” Although LED lights may not be the ultimate solution for lowering your energy bills, they have many benefits to offer and will pay back their increased costs many times over. 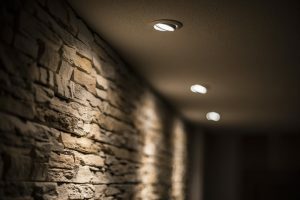 Below we’ve listed some of the reasons why working with an electrician in Nutley, NJ to switch to LED lights is worthwhile. How often do you have to change the lightbulbs in your lamps? Probably every few years, sometimes every year. An LED light can last for 50,000 operating hours, which is around 2 to 4 times longer than standard incandescent lights. The average lifespan for an LED light is around 11 years—your initial investment in the light goes a long way. This is the big reason people are interested in LED lights—they simply are more efficient at turning electrical power into illumination than incandescent bulbs. On average, if our electricians provide a complete retrofit of your house with LED lights, the drop in electrical consumption from lighting can be as much as 75%. There are even situations (such as where you have lights that are on 24 hours a day, like outdoor footlights) when the savings can be up to 90%. You know when you put your hand near a standard incandescent bulb that you feel heat from it. This heat radiating into a home can be unpleasant during warmer weather and puts more stress on the HVAC system, and it can cause the house to overheat during cold weather. LED lights don’t give off heat, removing this hassle and source of energy waste. Another benefit of this is safety, which is often overlooked in the list of LED light benefits. LED lights are small and come in almost any design you might imagine. If you want to arrange for an extensive retrofit for your house that redesigns much of the indoor and outdoor lighting, LED lights give you more options than other types of lights. Switching to LED lights will make the environment much happier. LED lights don’t contain any mercury that will get into landfills when the lights are thrown out. They also won’t clog up the landfills as fast because the average light is equivalent to 3 to 4 standard bulbs that get tossed into the trash. The general energy savings of LED lights also helps the environment by reducing the demand on power plants. Schedule an appointment with our electricians to learn how we can upgrade your household lighting for energy savings and more. Anderson Electric Corp is your trusted electrician in Northern New Jersey. Ask about making lighting upgrades for your home.